This is an easy dessert to make that everyone will love and it's pretty to look at too. In a small pan heat ½ cup of cream to just under boiling and pour over the white chocolate. Stir until it's completely melted and set aside to cool. Remove the green bits from the strawberries and place them on a baking pan. Roast strawberries for 15 minutes or until they start leaking juice. When they did this I flipped them over for about 5 more minutes to get roasting marks on both sides. When cream and white chocolate are cool, whip remaining cream to soft peaks and add the vanilla just at the end of whipping. Lightly fold the white chocolate mixture into the whipped cream. Fold half the strawberry mixture into the cream. 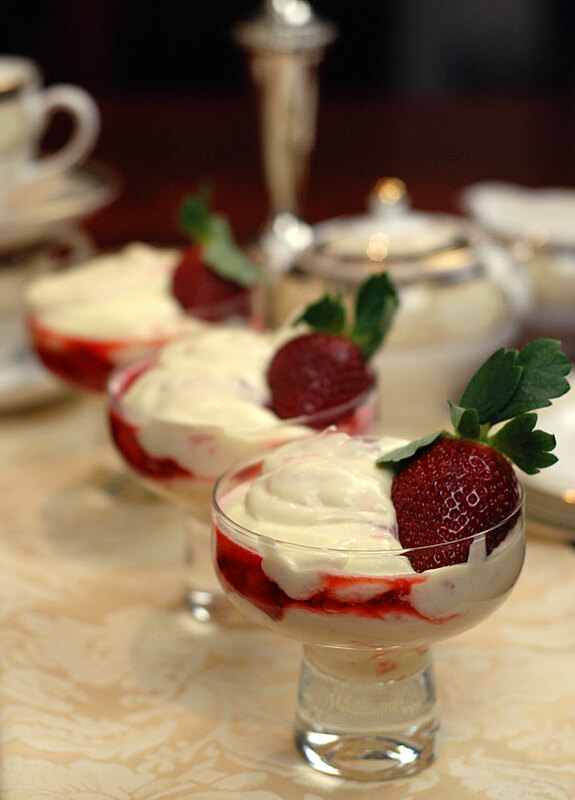 Layer the cream and strawberry mixture into a serving dish and top with a whole strawberry.